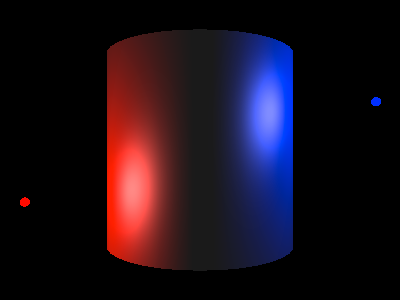 This article provides an introduction to the OpenGL Shading Language (GLSL). It contains sample C and GLSL code, and is accompanied by a diffuse/specular lighting demo with full source code. The code is available under an open source, BSD-style license and was designed to be as simple as possible, so that it can easily be used in other projects. If you’re not familiar with shaders, they are small programs that are executed on a per-vertex or per-pixel basis during drawing operations (there are also geometry shaders, which operate on geometric primitives, but they will not be covered in this tutorial). Although there were various other extensions for using shaders with OpenGL in the past, the OpenGL Shading Language (or GLSL for short) has been an official part of the OpenGL standard since version 2.0 and is now the preferred language for implementing shaders in OpenGL. Shaders give programmers much greater control over rendering than OpenGL’s fixed function pipeline, much of which has been deprecated in recent versions of OpenGL; OpenGL ES 2.0, for embedded systems, has even dropped the fixed function pipeline in favor of a shader-based approach. GLSL is therefore an important part of modern OpenGL development. In order to use GLSL shaders in OpenGL, we first need to know about shader and program objects, which will allow us to compile and link GLSL shaders so that they can then be used during drawing operations. Data may be passed from one shader stage to another (for example, vertex shaders often generate information that is passed to fragment shaders), and thus this mechanism for linking multiple shaders into one program object is necessary. * compiled from the given GLSL shader file. The above function first calls shaderLoadSource, another function defined in the shader.c file which simply returns a string containing the contents of the file with the given file path. Next, it creates a shader object using the OpenGL glCreateShader function and sets the shader’s source by using the glShaderSource function. Finally, the shader is compiled with the glCompileShader function, the memory containing the shader source string is freed, and error checking is performed. The function returns a GLuint value that can be used to refer to the shader object. * given type to the given program object. This function takes arguments containing the GLuint that represents the program object to attach the shader to, the type of the shader (such as GL_VERTEX_SHADER or GL_FRAGMENT_SHADER), and the path to the file containing the shader. It first calls the shaderCompileFromFile function that was described above in order to compile the shader; if the compilation is successful, it then attaches it to the program using the glAttachShader function and deletes the shader using the glDeleteShader function (as mentioned in a comment in the source code, the shader won’t actually be destroyed until the program that it’s attached to has been destroyed). As we will see later, these uniform variable locations will allow us to pass information to the shaders - namely the camera position and the position/color information of three lights. g_lightColor is a float array, the contents of which will be passed to the program object when we use it later. The sceneInit function then performs some other initialization tasks that are not important to our discussion of shaders. NUM_LIGHTS is simply a constant indicating the number of lights that will be used in the demo; this constant will make it easy to change the number of lights, if necessary. Next, we see some of the uniform variables that were mentioned earlier. These variables contain information passed from the OpenGL application to the shaders - in this case, the camera (or eye) position of the viewer and an array containing the position of each light. Uniform variables should be set by the OpenGL application before it starts drawing with the program object enabled - we will see how to do this towards the end of the article. Note the vec3 variable type, which is used to define a three component vector. The next three lines define some varying values. These are variables that are set by the vertex shader and can then be accessed by the fragment shader; the values are interpolated across the surface being rendered, similarly to how colors and texture coordinates are interpolated across surfaces in OpenGL. These values will be used by the fragment shader to perform lighting calculations. The first thing the shader does is pass the vertex normal to the fragment shader through the fragmentNormal variable; because this variable was defined as a varying value, its value will be interpolated across the surface being rendered. The built-in gl_Normal variable can be used in vertex shaders to access the normal of the vertex (the demo uses the glNormalPointer function to supply normal data). Next, the cameraVector variable is set to contain a vector pointing to the camera position from the current vertex. A similar operation is done to fill the lightVector array with vectors pointing to each light from the current vertex. The built-in gl_Vertex variable contains the non-transformed position of the current vertex (the demo uses the glVertexPointer function to supply the vertex position data). Finally, we set the built-in gl_Position variable, which contains the final transformed position of the vertex that should be drawn. We transform the gl_Vertex vector by the built-in gl_ModelViewProjectionMatrix matrix (which is simply the product of the current projection and model view matrices) to get this value. NUM_LIGHTS is once again simply the number of lights that we have. AMBIENT defines the ambient lighting value, which is the color of a fragment that has no diffuse or specular lighting contribution from any of the three lights. MAX_DIST and MAX_DIST_SQUARED are used to attenuate the lighting for fragments as their distances from the lights increase. lightColor contains the light color values passed in by the demo application; the X, Y, and Z components of these vec3 values correspond to the red, green, and blue components of the light colors, respectively. The varyings were set in the vertex shader and their values have been interpolated across the surface being rendered so that they can be used in the fragment shader; fragmentNormal is now the normal of the current fragment, cameraVector is a vector pointing to the camera from the current fragment, and the lightVector array contains vectors pointing in the direction of each light from the current fragment. We first initialize the overall diffuse/specular values for the current fragment; the diffuse/specular values that we calculate for each individual light will be added to these vectors. Next, we normalize the normal that was passed in from the vertex shader using the built-in normalize function; this is done because fragmentNormal has been interpolated and is thus not an accurate normal. We also normalize cameraVector to get a unit direction vector pointing to the camera. The MAX_DIST_SQUARED constant contains the squared maximum distance that a fragment can be from a light in order to be affected by it. We see two built-in GLSL functions here: dot returns the dot product of the given vectors, and min returns the minimum value passed to it. dist will end up being a value from 0.0 to 1.0 and distFactor will be the inverse. If the distance between the current fragment and the light is small, distFactor will be close to 1.0 (full lighting contribution); if the distance between the current fragment and the light is greater than or equal to MAX_DIST_SQUARED, distFactor will be 0.0 (no lighting contribution). The vector to the current light from the current fragment is normalized and stored in lightDir to give us a normalized direction vector to the light. The dot product between the fragment normal and lightDir is then calculated and stored in the diffuseDot variable. If the two vectors are pointing in exactly the same direction, the dot product will be 1.0, giving the full diffuse lighting value; as the angle between the vectors increases, the dot product decreases, and if they’re facing opposite directions, the dot product will be negative (in this case, the current fragment is not lit by the current light). Once we have the dot product, we use it to compute the diffuse contribution from the light and add it to the overall diffuse vector; note that we use the built-in clamp function to make sure that we don’t subtract from the diffuse vector when the dot product is negative. The red sphere represents an object being lit by a single light, and the point where the red, green, and blue lines meet represents a single fragment. 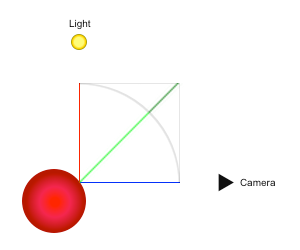 The red line represents the normalized direction vector to the light and the blue line represents the normalized direction vector to the camera. If these two vectors are added together, the result is the green line that reaches to the top right of the box with the gray outline; if this vector is then normalized, the result is the half-angle vector. In the figure, this half-angle vector is also exactly the same as the fragment normal, so full specular lighting would be applied to the fragment. This makes sense, as the light and camera direction vectors are at a 90 degree angle to eachother and the fragment normal appears to be at a 45 degree angle. After calculating the half-angle vector, we add 0.5 to each component of the light’s color to make the specular lighting appear brighter. Note that we can add the scalar 0.5 to the vector using the standard addition operator; the result is the vector with 0.5 added to each component. We also use the min function to make sure that no color component is above 1.0 after the addition. We calculate the specular lighting contribution of the light and add it to the overall specular value in a manner similar to how we did the diffuse lighting, but the clamped specularDot value is raised to a certain power, in this case 16.0. A higher exponent will give the specular lighting a narrower, more focused appearance. sample is a vec4 variable representing the natural color of the fragment, which is white in this case (the fourth component of the vector represents the alpha value). We combine sample, diffuse, AMBIENT, and specular to generate our final fragment color, which we assign to the built-in gl_FragColor variable, and the fragment shader is complete. After clearing the color and depth buffers, we call glUseProgram to use the program object that our shaders are attached to. We then set some uniform variables in the shaders using the glUniform3fv function, which allows us to set vec3 uniforms. For each uniform, we pass in the location of the uniform (which we obtained after linking the program object), the number of vectors at that location (which will be greater than 1 for arrays), and a pointer to an array of floats containing the vector data. The g_cameraPosition and g_lightColor values were initialized in the sceneInit function, while the g_lightPosition values are changed continuously by the sceneCycle function contained in the demo. Once the program has been enabled and its uniforms have been set, the glDrawArrays function is called to render a cylinder using vertex/normal data that was generated during scene initialization. The program is then disabled by passing a value of 0 to the glUseProgram function. The full C source code for the demo can be found on GitHub. It requires GLUT in addition to an OpenGL implementation with GLSL support. The source code is provided under a BSD-style license, so feel free to use any portions of it in your own projects.